Gold exudes luxury and these toggle switches are no different… It’s a combination that will go with most interior styles; from raw industrial to vintage period. The low sheen brushed brass switch plate sets off the retro toggle perfectly… a toggle which incidentally has an extremely satisfying on/off action hence being prepared for some heavy use from visitors. For full-on retro cool there’s nothing for it but to install toggle light switches. There’s just something so very appealing about them… Although do be prepared to endure much switching on and off of your lights. It’s addictive! This high-quality gold single toggle light switch is just one piece in our exclusive range of coordinating designer switches. A collection of contemporary switches and sockets to mix and match in line with your personal style. Check out our other gold switches and sockets that are just perfect for any industrial style interior where you want an opulent finishing touch. Our lovely, high-quality gold single toggle switch features a brushed brass back plate with a choice of black, silver or gold toggle switch. 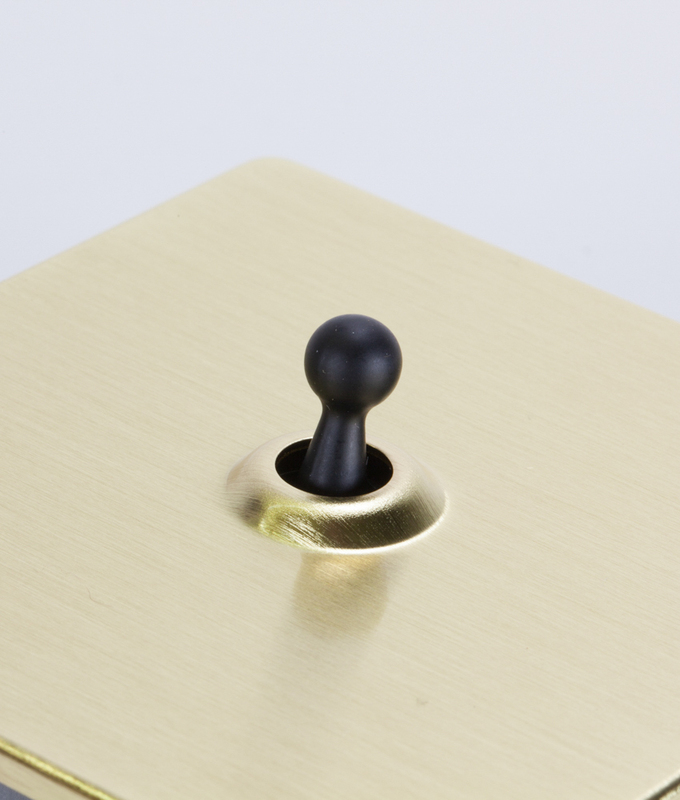 This stunning switch is a thoroughly modern take on brass plate light switches. With a minimalist design, no fuss or frills this switch is beautiful in its simplicity. Its only adornment is the fabulously retro toggle switch. In soft sheen metal, it contrasts wonderfully against the gold plate. This is a two-way switch so you can control one light in conjunction with another switch. Ideal for a stairway where you want to be able to turn your light on and off, at the top and bottom of your stairs. This collection of industrial style designer light switches is exclusive to us. The good news is, you won’t find them lurking in high street stores. If you love this single toggle gold switch, check out the matching double toggle switch and our other coordinating gold light switches and plug sockets.